Thank you to all who joined in our May challenge. We had so many fabulous entries! As usual we used random.org to choose the winner of our YNS prize pack, provided by OCS store. #71 is Kimberly S. !! Congrats! Email lora at onecrazystamper dot com to claim your prize. Be sure to check back tomorrow for our new monthly challenge. Good Morning. It is once again Wednesday and my day to post. The card I have to show you today is so beyond my usual and took me a long time to make. Truthfully, I still haven't mastered the technique like I wanted to but it will do for now. I used a line of stamps from Art Impressions called "Fronts and Backs". I like the effect of the little boy from both the front and the back view looking over the fence. I learned how to make clouds and create scenery for this card too. Thanks for coming by. Let me know what you think of these stamps. And, you still have a couple of days to enter our flower challenge for the month of May. Time flies by so fast, and by now I should be settled into my new home - I doubt that all the boxes are unpacked yet, but the animals and myself should be getting use to the place and the new routine! 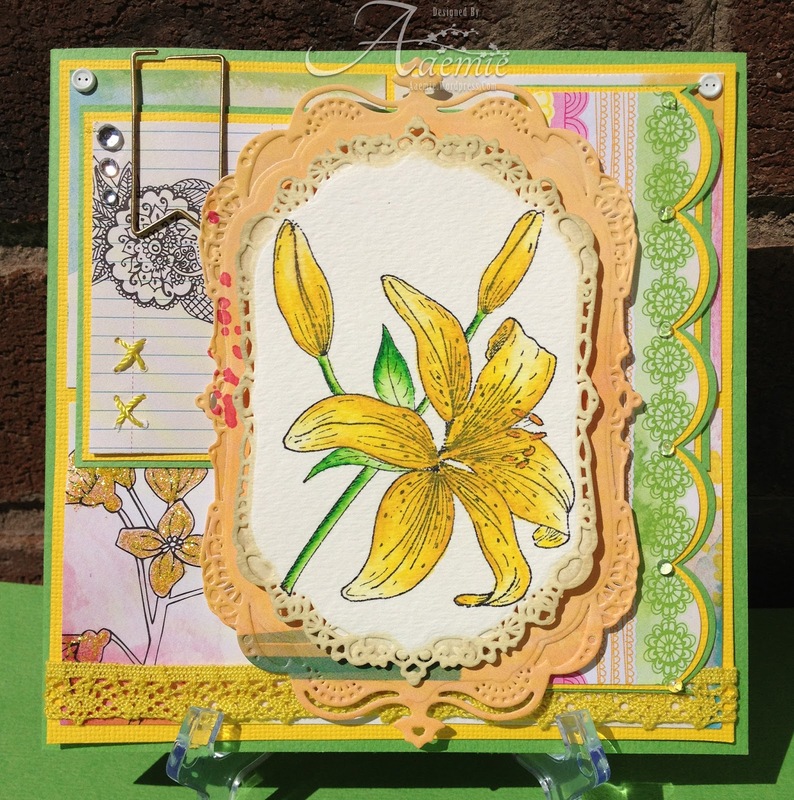 Today I have another card for this month's challenge theme of Flowers here at One Crazy Stamper. This little sweetheart is one of the newer images from Crafters Companion Angelica and Friends line and is entitled Grace. I have colored her with Copics, then matted and mounted her on dp from Simple Stories Vintage Bliss line. The small banner and the butterfly were cut from another piece of the Vintage Bliss paper, the flowers are from Prima, and the sentiment is included with the image. I finally recycled the packaging from some of my Prima flowers - the white doily is actually cut from the hard acrylic backing that the flowers come on. You still have a couple of days to enter the monthly challenge to win a fabulous prize package, and if you leave a comment on my card today, you have the chance to win this stamp set! Deadline to leave a comment is June 2, and I will announce the winner on my post here on June 4!!! 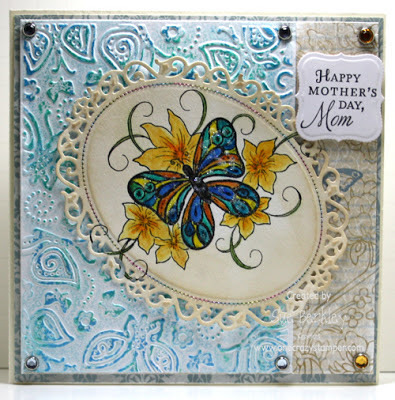 Since this month at OCS we are celebrating May FLOWERS (see our monthly challenge) I decided to make something other than a card with these gorgeous Prima flowers from the OCS. This headband I made for my (not so little) baby girl was super simple. 4- hot glue flowers to felt and then felt to the elastic headband. Thanks for stopping by and taking a look and please stop by the OCS to see all the gorgeous flowers in stock! 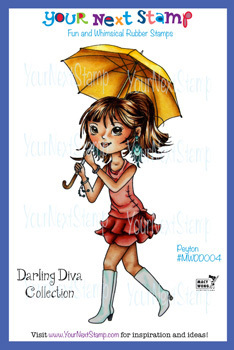 It is Sunday again and for today's post at One Crazy Stamper, I have used Roxy from The Darling Diva Collection by Your Next Stamp. As summer will soon be here, I'm sure we all will be enjoying these sweets at times. There are still a few days left to enter this month's Flowers challenge to win a prize pack of 2 Your Next Stamp. Next Saturday which is June 1st is the start of a new challenge. Until next week, keep busy being creative. I have a super cute card today using this adorable Saturated Canary stamp. The original image has glasses, but I didn't ink that area. I used a memento pen to carefully ink the eyes and face, as to not get any ink on the section I didn't want stamped. I wanted to use some cool brad glasses that I have for a little more impact and geeky cuteness. I then filled the lenses with glossy accents. For the balloon I added a layer of glossy accents then glittered and let dry, finishing up with a second coat of glossy accents and some twine for the balloon string. 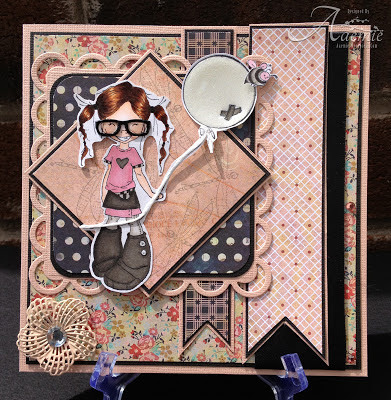 I also used a High Hopes dragonfly on the pink DP behind my balloon girl, that was stamped in grey ink. I hope you can handle the cuteness! There's one week left to join us in our May "Flowers" challenge. Don't forget, you still have time to enter our "Flowers" challenge for the month of May for your chance to win some amazing stamps! Labels: Copic Markes, Copic Xpress It paper, Kaiser Craft Rhinestones, Memento Inks, saturated canary, Shari G.
P.S check out the store there is a great sale on!! Good Morning! Wednesday just kinda snuck up on me this week with the long weekend (Monday in Canada), the horrible thunderstorms we have been having and my power being off more than it was on. But I did manage to finish a card to show you today. 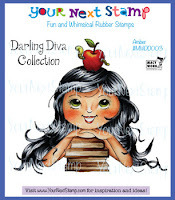 When One Crazy Stamper introduced the Your Next Stamp "Darling Diva" Collection I knew I had to have them all. Well, I do not have all of them but I do have half. This one is Summer and how fitting is she for the upcoming season. And I, of course, added a flower to follow our current monthly challenge. You still have time to enter; see the pinned post above for details. And the prize just happens to be a couple of the "Darling Divas". Thanks for coming by. Enjoy your day. I have used Rangers Distress Ink reinkers, and a water brush to color this cute Young Spring Fairy image from Whimsy Stamps. The image was stamped with Versafine Onyx Black ink on water color paper, colored and fussy cut, then placed on some older My Minds Eye designer paper. The border of flowers is the Memory Box Spring border die, which I cut from several colors of cardstock to get the various colors of flowers. The ribbon, charm and sentiment are all from my stash. Details for this months challenge are available by clicking on the icon at the top of this blog. Be sure to get creative and enter to win the fabulous prize offered!!! Happy Monday, OCS friends! If you haven’t heard, this month at OCS our challenge theme is FLOWERS. You have until the end of the month to join in and get an entry into our monthly challenge prize drawing!! I used this gorgeous gray flower from Maya Roads on my card and since I HATE to waste, I made it into a removable barrette. I realize that not every person I make a homemade card is going to hold on to it forever. And the thought of this pretty flower finding it’s way into the garbage makes me cringe, so I gave it another function. It was really very simple to make the barrette, I just hot glued the flower to a 2 pronged clip that I bought in bulk from my local beauty supply store. The clips are really inexpensive and convenient to have on hand. I'm sitting on the balcony of our hotel overlooking Little Tub Harbour in Tobermory enjoying the gorgeous weather while having a cup of tea. The weather is absolutely gorgeous for this first long weekend (Victoria Day) holiday of the summer. As we have hit a couple of new milestones in our life's journey which is always a roller coaster ride, we decided we would make an escape from the hustle and bustle of home. Yesterday, was Ian's 65th birthday as well as our 39th wedding anniversay. The card below is for his birthday. I used copic markers to colour the image and then prismacolour pencils to add some shading and depth. The edges of the die cuts were inked with Antique Linen Distress Ink. There is still plenty of time to enter this month's Flowers challenge at One Crazy Stamper. 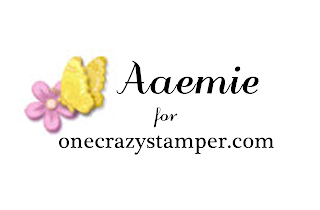 While you are being creative check out Lora's store, One Crazy Stamper for some great products and deals and the One Crazy Stamper blog for some great inspiration. The long weekend is here, time for planting and some R&R. Since I don't have a garden, I plan on doing some more spring cleaning and crafting. Today Im using a beautiful tiger lily, which I paired with some lovely bright papers. I used my derwent inktense pencils on this image, and added a bit of stitching and stickles on the card. Dont forget to follow OCS on Pintrest and Facebook, also we have a great prize pack this month for our "Flowers" challenge. If you love the new Your Next Stamp darling divas collection like I do, enter for a chance to win 2 of them. Hello and Happy FRIDAY! I am so excited it is finally the weekend as this weekend is a long weekend here is Canada and I plan to relax, craft and sit out on my back deck having a couple of frosty ones! 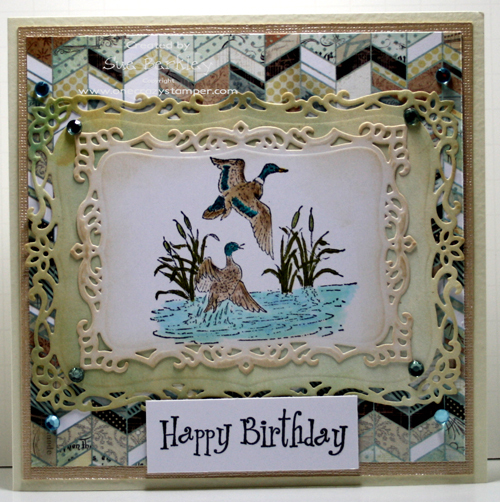 If you would like to see the inside of this card, pop over to my blog! Until next time, keep crafting! Labels: Copic Markes, Copic Xpress It paper, Memento Inks, saturated canary, Shari G.
just a reminder to join us over at the challenge blog..this months theme is FLOWERS..
polka dots on the shirt I used a Glue Pen and Glamour Dust!! Well I hope you enjoyed my card and thks for stopping by!! 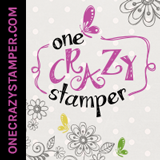 Welcome to another Wonderful Wednesday at One Crazy Stamper. It is once again my turn to show you a project that uses supplies from One Crazy Stamper store. I am very bad at "collecting" the cards I have made instead of sending them but am proud of myself that the last 5 cards (including today's here) I have given away. Any one else like me and make more cards than they give? Today's card I made for a friend who had a baby boy. I used an adorable image from High Hopes along with the matching sentiment. Oh, and there is a girl version of this as well. This gorgeous young lady is Gardener Gayle﻿ from Saturated Canary, which I have colored with Copics. 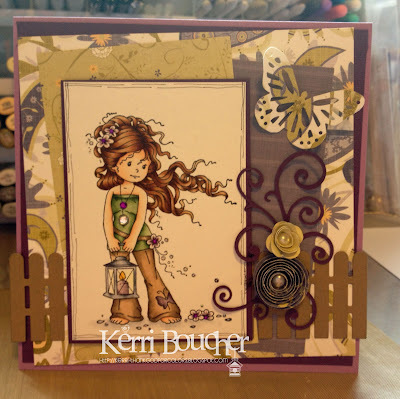 The image was then cut with one of the newest Spellbinders dies called Opulent Ovals, then the edges and background were inked with the Antique Linen Distress Ink Pad. The card front has layers of designer paper from Graphic 45's Secret Garden collection, and various Prima flowers. The centers of the lily of the valley flowers all received a bead of Frosted Lace Stickles. 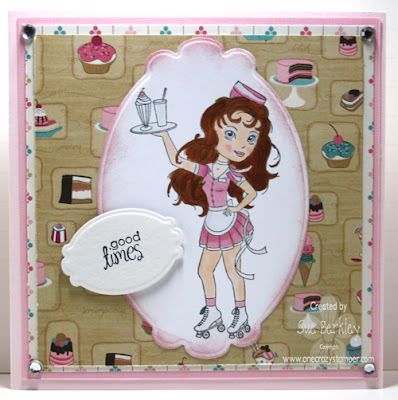 I’m excited to show you a new stamp set from Lawn Fawn that OCS carries. The possibilities with this stamp set is endless, take a look at all the set includes. I’ve created a little scene with a few of these stamps. I colored with my copics and fussy cut them, but OCS carries the matching dies to this set also HERE. So I am wondering, are you a fan of Lawn Fawn stamps or are they not your cup of tea?! My card today for One Crazy Stamper is a card for my Mom, as today is Mother's Day. To all the mothers out there, have a wonderful and Happy Mother's Day. Instead of using Copic Markers, I have used Derwent Inktense Pencils and Faber-Castell Gelatos. I ran the Garden Delight M-Bossabilities through the Cuttlebug and added the Faber-Castell Metallic Blueberry and Metallic Mint Gelatos to the top. I then spritzed it with a bit of water and rubbed my finger all over. After I cut the butterfly out using the Floral Ovals, I added the back stitch using a verigated metallic thread, and then distressed it using the Antique Linen distress ink. I then added some Crystal Glamour Dust from Deco Art. There is still plenty of time to enter this month's Flower Challenge for a chance to win a prize pack from One Crazy Stamper. 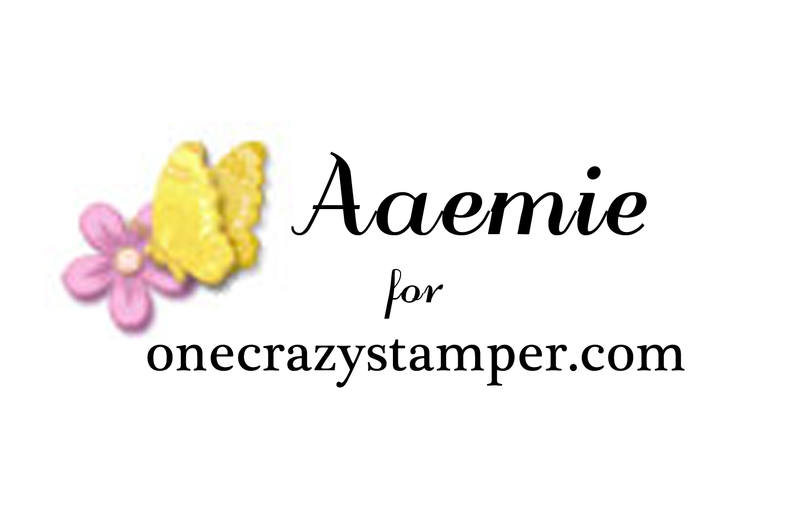 All the supplies I have used can be found at Lora's store One Crazy Stamper. Since its almost Mothers Day, I have a pretty card that I think that any mom would love. I made this one without any colouring, but used many die cuts and other embellishments. For the flower vines I just glittered the flowers and then cut a slit in the jar on my DP and tucked them in. I then added a bow die over it. 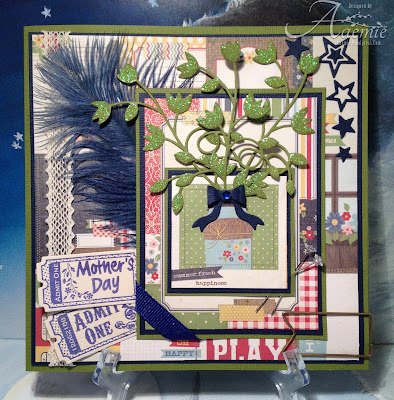 For the sentiment I used a Mothers Day stamp from my stash and stamped that onto my ticket die, finishing up with a beautiful blue feather, lace trim, pins and a banner paper clip. Cute don't you think? Im loving all the flower entires in this months "Flower" challenge, cant wait to see more! Hello and happy Friday! Today I have a really fun card to show to you that I made for one of my Husband's friends. For me this is a pretty plain looking card, but I wanted my focus to be on the image itself and not all the details we love to add to cards, hope you like it! I hope that you enjoyed today's card and dont forget to enter into our fun Challenge this month - Flowers! See you next week! Labels: Copic markers, Copic Xpress It paper, High Hopes Rubber Stamps, Memento Inks, Shari G.
15 Years Ago..One of the Best Days Ever! !